The long-running debate over the propriety and proper scope of diversity jurisdiction has always centered on the traditional justification for diversity jurisdiction: the need to avoid actual or perceived state-court bias against out-of-state parties. 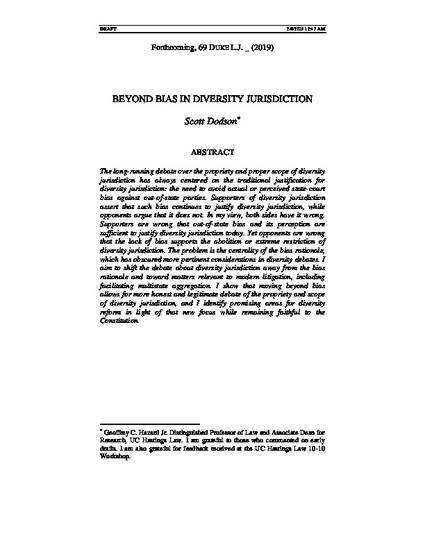 Supporters of diversity jurisdiction assert that such bias continues to justify diversity jurisdiction, while opponents argue that it does not. In my view, both sides have it wrong. Supporters are wrong that out-of-state bias and its perception are sufficient to justify diversity jurisdiction today. Yet opponents are wrong that the lack of bias supports the abolition or extreme restriction of diversity jurisdiction. The problem is the centrality of the bias rationale, which has obscured more pertinent considerations in diversity debates. I aim to shift the debate about diversity jurisdiction away from the bias rationale and toward matters relevant to modern litigation, including facilitating multistate aggregation. I show that moving beyond bias allows for more honest and legitimate debate of the propriety and scope of diversity jurisdiction, and I identify promising areas for diversity reform in light of that new focus while remaining faithful to the Constitution.